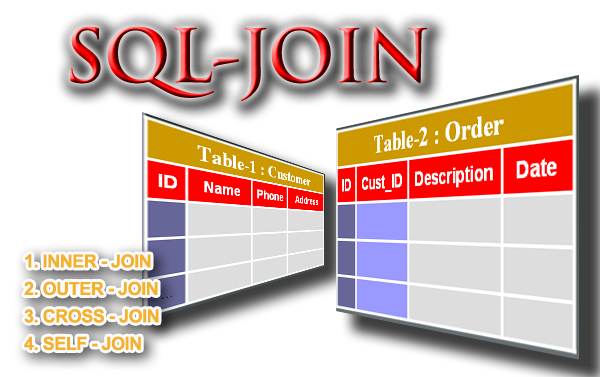 JOINs are used to access the data that combined together from multiple tables simultaneously. Previously, JOIN-operations was performed in WHERE-clause, but new syntax introduce JOIN-statement as extention to FROM-clause, so that you can implement JOIN within FROM-Clause instead of WHERE-Clause. Note that still you can use previous syntax for JOIN that does not includes JOIN-statement. ANSI Standard: According to ANSI specification, joining condition must be in FROM clause. Readability: It increases readability; you can easily determine the kind by finding relevant keywords as INNER JOIN, OUTER JOIN, and CROSS JOIN. Filter Isolations: It isolates the joining conditions from data filtering condition. So, you can specify joining condition in FROM clause and data filtering condition in WHERE clause. For joining, the column types to be joined need not be same but values expect same. JOINs not only work with SELECT-statement they also work with UPDATE and DELETE statements. INNER JOIN: It merges (or combines) matched rows from two tables. The matching is done based on a common columns of tables and their values satisfying joining condition. LEFT Outer Join (a.k.a LEFT-JOIN): Returns matched rows from two tables and unmached from LEFT table (or first table) only. RIGHT Outer Join (a.k.a RIGHT-JOIN):Returns matched rows from two tables and unmached from RIGHT table(or second table) only. FULL Outer Join (a.k.a FULL-JOIN): Returns matched rows from two tables as well as unmatched rows also from two tables. CROSS JOIN: This join does not merges/combines instead it perform cartesian product. It is similar to simple SELECT without joining condition or without WHERE-cluase. The other categories of joins are Equi-join, Natural Join, Self Join etc these can be achieved using INNER JOIN , OUTER JOIN and CROSS Joins. Using CROSS JOIN, you can achieve Cartesian product. OUTER JOIN merge records M+N for match; (M-R) X (N-R) for unmatched. CROSS JOIN perform Cartesian product as M X N.
INNER JOIN works on conditional matching and returns matched rows from multiple tables. Using INNER JOIN you can achieve EQUI-JOIN, NATURAL JOIN, and SELF-JOIN operations. Natural-Join (based on equality condition and result doesn’t contain duplicate columns). Self-Join (Joining a table to it self). It is Default JOIN operation. i.e, you can use just JOIN keyword instead of INNER JOIN in the query. Using CROSS JOIN with equality condition in WHERE clause, you can achieve INNER JOIN. i.e, you can assign filtering condition in FROM clause also. Achieving INNER JOIN using CROSS JOIN. Unlike INNER JOIN, OUTER JOIN retrieves both matched and unmatched records. OUTER JOIN can be LEFT, RIGHT or FULL outer Join. LEFT OUTER JOIN (simply LEFT JOIN), returns matched records from both tables and unmatched record from first(left) table. Similarly, RIGHT OUTER JOIN(simply LEFT JOIN) returns matched and unmatched records from second(right table). FULL JOIN (Full Outer Join) returns matched and unmatched records from both the table. If no matching rows found, the associated result row contains null values for all select columns. "LEFT|RIGHT|FULL" [OUTER] JOIN RightTable ON "join condition"
CROSS JOIN returns all possible combinations of rows from both joined table. Using CROSS JOIN without WHERE clause, you can achieve Cartesian product. Achieving Self-join using CROSS JOIN. Using OUTER JOIN you cannot achieve CROSS JOIN or vice versa. Similarly, using INNER JOIN you cannot achieve OUTER JOIN, CROSS JOIN. Cross Join returns zero-rows resultset when either of the table is empty. Deleting COMMON records from RIGHT table only. Deleting UN-COMMON records from BOTH tables. Deleting UN-COMMON records from LEFT table only. Updating all records of Left tables that matches(COMMON) with right table. You can't update more that one table in a single statement. Updating all records of right tables that matches(COMMON) with left table. Updating all records of table1 those are UN-COMMON with table2. Find all records of two tables those are unmatched with each other. Find all records of RIGHT-table those does not matched with LEFT-table. T-Sql allows you to nest the sub-queries within JOIN Clause. Free Internet Learning-When it involves obtaining started on the internet one amongst the most effective ways that to induce started goes to be a free internet business chance. the rationale this can be the most effective approach is as a result of you virtually don't seem to be about to need to place any cash into it so as to induce started and check it out. The approach that this works is essentially the corporate offers you a free trial for you to envision out the corporate and everything that must supply. If you're glad with what it's to supply and you keep you are merely about to be paying an inexpensive monthly fee.